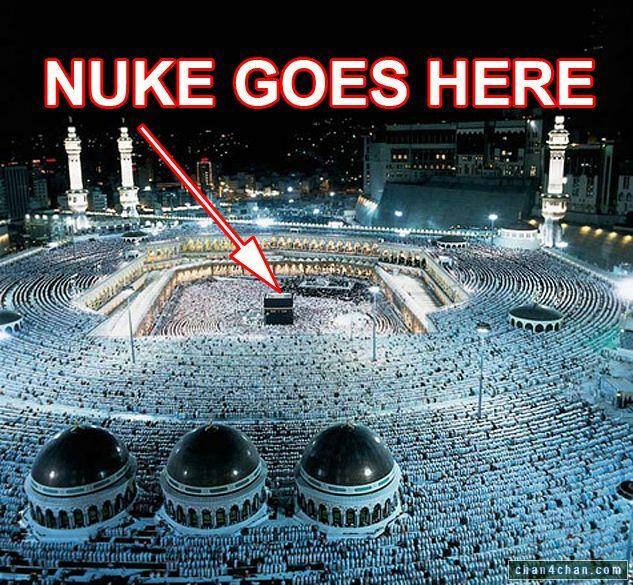 Comments Off on Nuke Mecca? US. Rep Tom Tancred has touched off a firestorm of controversy by commenting that in response to a nuclear attack on the United States, a military response to such an attack might include bombing Moslem holy sites such as Mecca. Hugh Hewitt spent most of his show on July 18th trying to defend pluralism and verbally spank the Congressman for his remarks. Many former military members called Hewitt’s show defending the idea that all options must be on the table including nuking Mecca. I think Hewitt was surprised that so many would agree with the Congressman. Hewitt tried to dismiss the Congressman as a fruitcake that should apologize as soon as possible. While Mecca would not be at the top of my targeting list, I think that we learned that it is a bad idea to publicly rule out any type of target. As soon as we announced that mosques in Iraq were off limits to American soldiers and should be protected, guess where all the terrorists congregated? Had we then destroyed the buildings, perhaps it would have been a good tactic. However, more Americans died due to these politically correct limitations on the war. I think the President was right when he said that you are either with us or with the terrorists. I just hope Iran and Syria get visited by some of the more elite members on Uncle Sam’s payroll. Hewitt discounts the assertion that the Global War on Terror is a religious war. I believe that it has been since the Beirut barracks bombing. It just took us two decades to take it seriously. We may not be at war with all of Islam but we are at war with a denomination within the Islamic world. The people at war with the West are the true believers. Those that believe their scripture is the word of their god and take it literally are the ones we are fighting. In the West, if I believe that the Bible is true and should be taken literally I am a good Christian. Why is this normative for me but if I follow Islam, and believe the same things about Koran, then I am a terrorist. It seems to me that destroying the West is the true form of Islam, and the type that George Bush hopes that the Islamic World will adopt is a heretical form. This isn’t the view being popularized today but based on its history; I think it is a more realistic view of Islamic history. It is clear that the God of Christianity is incompatible with Allah. People like Hewitt will take pluralism over orthodoxy. Pluralism is just a temporary cease fire until one side gains an advantage over the other. The political consensus in the West is just a new version of Roman theology. In ancient times, you could believe in any god as long as you declare that Caesar is Lord. Now, in America you can have any god as long as the Constitution as interpreted by the Supreme Court is Lord. This was never the intent of the Founders. Freedom of religion as found in the First Amendment was intended to allow for a variety of Christian sects not equality of all faiths or freedom from religion. Both are distortions of original intent. Forcing a pluralistic template upon the Mohammedans of the world will not succeed. 9-11 was the modern equivalent of the barbarians sacking Roman in the declining years of the Empire. Will our leaders get a spine or repeat history? I think we have yet to properly identify our enemy and have the will to deal with them.